Start your Lanai Snorkeling Trip with Kona coffee, passion orange juice and ice water during check-in at Slip #11 in Lahaina Harbor. Souvenir photographs are taken by a professional photographer when you board our Explorer Super Raft. After leaving Lahaina Harbor, we head across the Au’au channel to the island of Lanai for snorkeling. 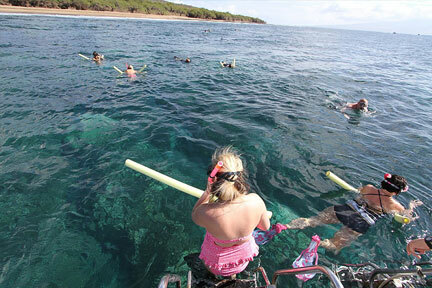 Two snorkel sites are selected by the captain to provide the clearest and calmest ocean conditions. Snorkel gear, instructions and safety tips are provided by our experienced captain and crew. Spinner and bottlenose dolphins are often encountered off the island of Lanai. We see lots of tropical reef fish, green sea turtles and occasional manta rays at the snorkel sites. Lunch (Turkey or veggie wraps, ranch dressing, chips and cookies) is served on-board at one of the snorkel sites. Unlimited sodas, juices and bottled water are available throughout the Lanai Snorkeling Trip. 1. Travel to and see another island from the water – Lanai, the pineapple island. 2. This Eco-Adventure is on one of our Explorer Super Rafts, the largest in the islands and the only rafts with an onboard restroom. Our Explorer Super Rafts are powered by twin diesel engines and are fast, comfortable and stable with the “Cadillac Ride”. 3. Our Marine Eco-Adventure includes some of the most pristine snorkel sites and reefs in the Hawaiian Islands. We have an excellent chance of seeing large schools of Spinnner and Bottlenose Dolphins, Green Sea Turtles, Manta Rays, tropical reef fish and colorful coral. 4. An inexpensive half-day morning Eco-Adventure with snorkeling at uncrowded sites and viewing of Lanai’s resident pods of Spinner and Bottlenose Dolphins – a truly unique experience. Come join us on the Lanai Dolphin Adventure one of Maui’s Best!!! Whale watch on all our tours between December and April. at 7:30 AM, Tuesday, Thursday and Saturday. *Total price includes all taxes and fees. Internet Bookings Receive 10% Discount & require 72 hours advance booking please. If closer in time, call 808-661-5550 or email for reservations! ** Repeat Customers call 808-661-5550 for a discount (not bookable online). All activities are at your own risk, rafting is best suited for the physically fit, outdoor adventurer. We take no pregnant women or those with serious health concerns, recent surgery, or history of neck or back problems. Be aware there is No Smoking permitted on board the boat, or at the dock per State law. If you would like to get off the boat and explore Lanai, try our Lanai Landing Snorkel Tour with 3+ hours to explore Hulope Bay and Marine Preserve. Spinner Dolphins get their name from how they jump and spin in the air! Lanai has a resident pod of over 200 Spinner Dolphins we see regularly. Children I understand there is a 48 hour cancellation policy for a refund.